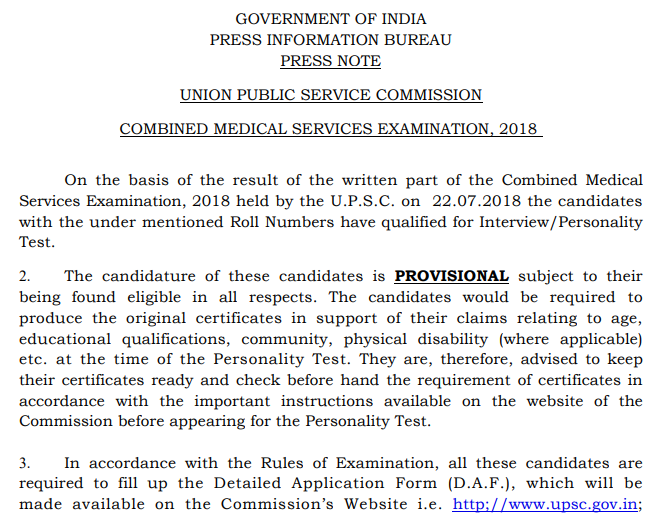 UPSC CMS result 2018 announced on 27th August. Union Public Service Commission made the results available on www.upsc.gov.in for the written test conducted on 22nd July 2018. The Commission has issued a PDF file consists of roll numbers of candidates who have qualified for the personality test/ interview. Schedule of the interview will be provided on the official website of the commission. Of the total, candidates with satisfying results of Combined Medical Services written test are shortlisted. The candidature of these candidates is provisional subject to their being found eligible in all respects. All the shortlisted candidates have to fill up the detailed application form which would be commenced on 13th September. DAF must be filled before 6 PM on 27th September on the Commission’s portal i.e. www.upsc.gov.in. Candidates should keep original certificates ready in support of Community, age, educational qualifications, physical disability (if applicable) etc. at the time of interview. All the important guidelines regarding Detailed Application Form and personality test will be provided later by the Commission. Before filling up the DAF, candidates will have to register themselves. They will also need to upload the scanned copies of relevant certificates/ documents. As the requirements and other details will also be given on the e-Summon Letter. If a candidate, does not bear any or all the required documents, then, he/ she will not be allowed to attend the personality test. 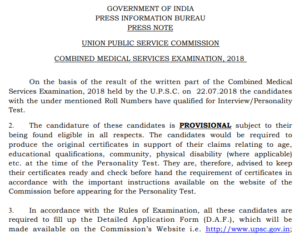 Union Public Service Commission will upload the marksheets of those candidates who have not qualified the written test after the declaration of the final result (after personality test). It will remain available on the website for 30 days. Candidates would be able to access their marksheets by entering their roll number and date of birth. The printed/ hard copies of mark sheet would be issued by UPSC based on the specific request by a self-addressed stamped envelope. Candidates need to make the request within thirty days of publication of marks on the Commission’s website. To check out the selection list, candidates first need to visit www.upsc.gov.in. Written exam UPSC CMS result 2018 link has been provided in the news section. Click on it and a PDF file will open comprising of the roll numbers of selected candidates. For More Updates, Stay Tuned With ALL INDIA ROUNDUP.